Gas laws can be a challenge for many high school level students and teachers, for many reasons. The availability of gas canisters is, at least in my state of Colorado, mostly banned or restricted due to safety concerns, leaving teachers with the need to produce their own for use in the lab. Students can sometimes struggle to grasp gas behavior, as it’s much harder to visualize gases rather than readily available solutions, solids, or mixtures. Indeed, for many labs, if gas is a product, we’re often relegated to using balloons or gas columns to capture and measure the gases produced by reactions, which can be tricky or expensive. So this year, I tried something a little different when starting my intro chemistry students’ gas laws unit, and was very happy with the results – start with an inquiry approach, allowing students to discover gas laws on their own, thanks to easily producible gas phenomena in the lab. This activity was set up in a stations format, with some stations repeating the sorts of gas investigation, and others entirely different. 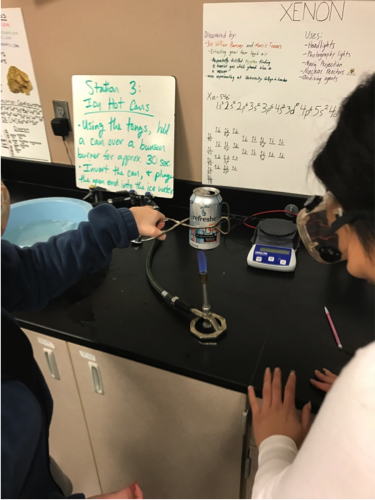 Students were faced with situations such as heating/cooling a sealed syringe to investigate volume change, heating a aluminum can over a Bunsen burner and then inverting into ice water, and placing an inflated balloon into a vacuum chamber. Simple examples, to be sure, but surprising or dramatic enough (especially the “crushed can”, a perennial student favorite) to capture student attention and engage them in discussion. At each station, students were tasked with making detailed observations before, during, and after, and then discussing in a roundtable format with small groups of classmates with regards to their observations and what could explain the phenomena observed. This connectivity allowed students to mull their questions out loud, and address other students’ thoughts; I found it intriguing to hear students correcting one another’s thoughts on gases, and the debate that arose. Having seen how gases behave in a variety of situations, students were more readily able to build their “own” gas laws so that when the named laws of Guy-Lussac, Dalton, and others were revealed, students had already formed those relationships, and the remainder of the unit became more exploration and application, rather than top-down instruction. This was extremely effective in aiding their ability to manipulate gas laws and apply them in novel situations, as well as to take their knowledge of gas behavior and apply it to drawing particulate diagrams and scientific debate. 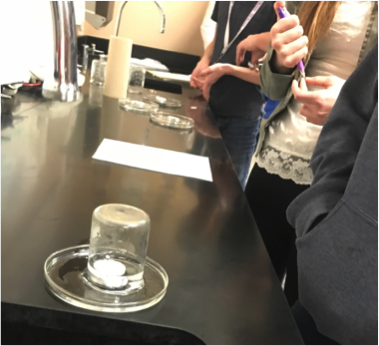 On formative and summative assessment for this unit, I found many students were recalling their experience from the beginning lab activity to help them explain gas behavior as it pertained to new experiences or tasks. While this was not my first time using a phenomenon-based engaging activity to begin a unit, it was certainly the most poignantly effective that I’ve experienced in the classroom, and will influence the way I approach many other units, not just gas behavior. Thanks for sharing your experience in doing gas as station exploration. Do the students move from station to station or do they just stay with one and try to "solve" the problem at hand then present to whole class? I have done many of the same labs you did, but more like a demo rather than self exploration. 1) Heated soda can in icy water. 2) Lit candle floating on water then covered with beaker. 3) A balloon covered empty flask in vacuum chamber. 4) hard-boil egg being sucked into cooling Eylmer flask. 5) shaving cream and marshmallow in vacuum chamber. 6) Sock cannon made from PVC pipes and Calcium Carbide. What other demos do you show? What was the picture with the three balloons? Thanks for your comments and questions! I used to do most of these as demos instead, also, but discovered they are more effective as hands-on experiences for the students! I have used them as station activities, so that the students get all the exploration, but I like the idea of students focusing on one and becoming “experts” to tell the class about their experience! The picture of the balloons was to show a “sad example” of capturing gas in a balloon from a magnesium/HCl reaction, from a stoichiometry lesson, rather than a more dynamic exploration of gas laws that students get from this station activity. With regards to demos, I also show the classic “whoosh bottle” to discuss pressure/temperature dynamics (isopropyl alcohol in a large plastic bottle ignited), as well as the marshmallow in the vacuum chamber example. I haven’t used the egg/Erlenmeyer flask demo, mostly because I didn’t want to use that many eggs! But I’ve had students do a similar activity with a candle in water, then invert a beaker over it and watch the water be “sucked” into the beaker as the flame is extinguished. I like to have students do the demos/stations as well also use ivory soap heated in a microwave as part of the demos I do in the class to illustrate Charles's Law. How do you get them to derive the gas law equations? I get them to discuss the process but getting them to convert it to algebra usually leads to issues. The soap example is great! I’m usually loathe to drag a microwave in to my classroom, but that’s a great idea to further discussion with such a vivid example of Charles’ Law. After students have travelled through the stations, they’re asked to discuss their observations, on a macroscopic scale. (What changed? How do you know? What happened as a result of the change?) Using these questions are usually enough to bring the students to exclamations such as “oh! As temperature decreases, pressure decreases!” or “As temperature increases, volume of a gas increases!” This leads to some whiteboarding and graphing of these relationships and discussion of the difference between an inverse relationship and a direct relationship. Hopefully this helps!